Special Offer Celebrating the New England Patriots! Congratulations to the New England Patriots on their Super Bowl XLIX victory. The team got the job done, and fans from all over New England will be gathering for a Duck Boat parade in Boston on Wednesday, February 4. If you’re attending the parade, we invite you to come to the Aquarium after the parade. Visitors wearing their Patriots fan gear will get a super deal on admission. 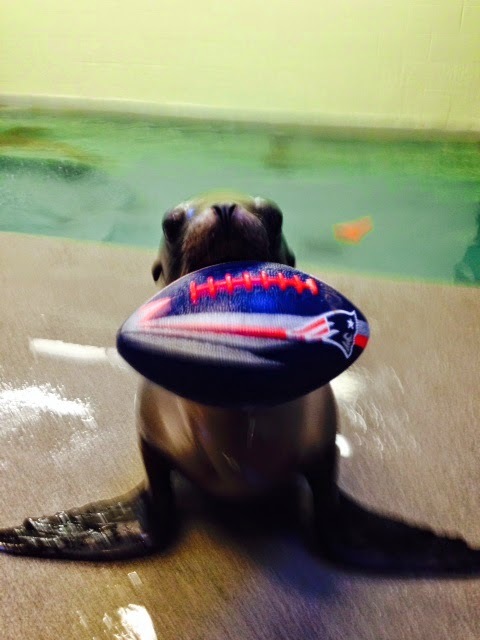 On Wednesday, February 4, 2015 from 9 a.m. to 5 p.m., the Aquarium invites Pats fans to come celebrate the extraordinary win with a visit to the Aquarium and receive special buy-one-get-one free admission for visitors wearing their Patriots fan gear (or at least red, white and blue). Valid on 2/4/15 between 9 a.m. and 5 p.m. only. This offer is good for one general admission to the New England Aquarium with the purchase of one full-priced admission of equal or greater value. One coupon per group. Discount offers may not be combined with other offers. This coupon must be presented at time of purchase. Not valid on IMAX Theatre or Whale Watch tickets. No cash value and not valid on tickets purchased online. Limited Time: Special Charlie Card Discount!